January 2014 Note to Readers: Maryon and her husband Lloyd have both recently passed away. Upon reflection, we’ve decided to leave this story in place here on the blog, in their memory. Both left a legacy of friendship and service to their community. They’ll be missed as great neighbors and very good and kind people. DD. From her family home near the corner of NE 21st and The Alameda, Maryon Lewis Kinsey has witnessed almost 80 years of Alameda neighborhood life. Maryon, with her sister Jeanne and parents Mary M. Lewis and Charles E. Lewis, moved to the neighborhood in 1928 when her father, Charles, took the job as principal at the still-new Alameda School. Her younger sister, Gretta, was born in the house. The Lewis-Kinsey home — purchased at auction in 1928 like many other homes in the earlier years — is perched on the edge of the Alameda Ridge on the far west side of the neighborhood. While the family has made several changes over the years, you can definitely recognize today’s house from the image in the original advertisement. Above, advertisement from a 1928 edition of The Oregonian for the house on The Alameda where Maryon grew up. Below, the same house today. A few other nuggets came up during a recent conversation with Maryon: Prior to construction of the surrounding houses, she remembers looking out her windows and seeing beautiful pheasants in the long grass of the open lots next door. “We called them ‘China pheasants’ and they had beautiful plumage…very exotic for us kids,” Maryon says. She remembers one summer playing with a neighbor girl. The weather was warm and the girls decided they needed an ice cream. Anderson’s, the grocery store that occupied the current “Garden Fever!” space at 24th and Fremont delivered their goods throughout the neighborhood. The girls phoned in an order for ice cream and a few minutes later, someone from Anderson’s made the delivery to the front door. During the Great Depression years of the early 1930s, she remembers men coming around to the house asking her mother if they could do odd jobs around the place. “Mother never hired them, but she always had coffee, soup and roll for them.” Maryon remembers sitting at the top of the basement stairs peering over the railing at them as they enjoyed their meals. Maryon and Lloyd lived for a few years in Eugene and in northwest Portland before buying the home from Maryon’s parents in 1956. In 1967, Maryon became the first woman TV reporter for KOIN-TV, where she worked until 1974. “I loved being a reporter,” she says. My father was delighted with his new assignment! In September 1928, he would be the new principal of Alameda Elementary School in Northeast Portland. The only drawback was that we lived in Multnomah. In 1928 that was a really long daily commute winding around Terwilliger Boulevard, through downtown and across a bridge to the east side of town. So my parents went house hunting. They found a home that just suited the family…three bedrooms, a view out over the city and within easy walking distance from the school. Alameda had no kindergarten at the time, so I had to wait two years before I could join my father and second-grade sister when they walked off to school each morning. I made friends with neighborhood children, and before I set off to play Mother made sure that I could identify my new home if I got lost. 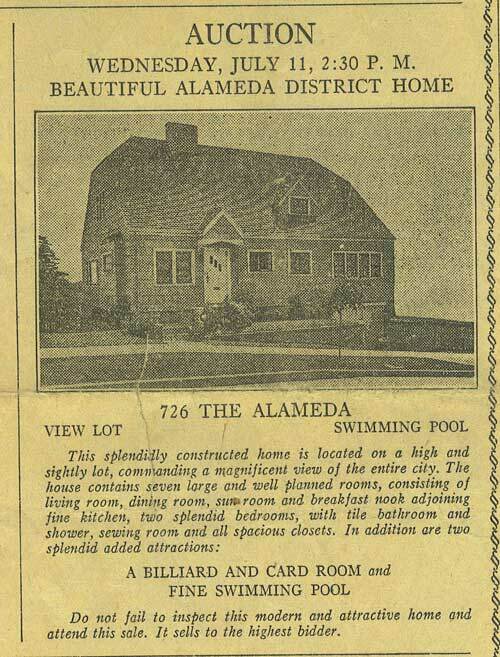 I learned my address was 726 “The Alameda.” It was quite a few years before the word “Northeast” was added, as well as the address numbers changed. Our phone was Garfield 8174. There were plenty of places to play called “vacant lots”…wonderful for make-believe safaris, hide-and-seek in the tall weeds and plenty of room to build forts. Two houses stand today on vacant lots to the east of our house, and we had three or four choices in the block across the street. Twenty fourth and Fremont was the hub of our village. When I was five or six, my mother would give me twenty-five cents and send me to the barber shop to have my hair shingled up the back, the sides cut so just the tip of ears showed. I was also delegated to pick up shoes repaired by Mr. Rumpakis in his shop next door. The odor of leather and the humming noise of the machinery comes back to me as I remember those visits… visits that continued through my teen years and into late middle age. Though polite, Mr. Rumpakis was never talkative, and I took this on as a personal challenge. Finally, I asked him how to say “Merry Christmas” in Greek. He turned off the noisy machines, and carefully pronounced the words over until I got it right. After that, I would learn a new word or phrase each visit. On the corner was “The Drugstore,” probably more correctly named the Alameda Pharmacy, owned by Chris. In addition to the usual items found in such an establishment, a soda fountain graced the center of the store. This was the focal point, you might even call it “the club” for teenagers who gathered each evening to visit with their comrades not seen since they walked home together from school. I’m sure we were noisy, but I don’t remember anyone getting out of line, or causing Chris any major trouble. Just south of the drugstore was a grocery. Eventually, a Safeway was built where the bank stands today. A Standard service station stood for years on the northwest corner. Everybody seemed to know Mel who ran the place, whether they were regular customers or not. The neighborhood has of course changed through the years, but in many ways has stayed the same. It has maintained a feeling of community and pride. Many people have stayed in the area for many years. Others have moved away only to return. Since that Fall of 1928, our house has sheltered five generations of one family. My younger sister entered this life in the master bedroom of our home; my grandmother left from the same place. It has hosted family reunions, neighborhood reunions, four family wedding receptions and countless birthday and anniversary celebrations. My husband Lloyd taught for many years in the school my father came to in 1928, and also represented the district for four sessions in the Oregon legislature. My son displayed Grant’s colors in cross country and track events; our daughter was a student body officer for the same school. Seventy-eight years are a long span for living in the same house, but we feel good about the accomplishments from our past, and the possible adventures for our future. I read this site regarding your family with great interest. Mr. Kinsey was my 6th grade teacher at Alameda Elementary back around 1963 or so. I am now 56 years old and remember how much I respected Mr. Kinsey. I never have forgotten him. My family lived on the corner of 23rd and Regents Drive, just down the hill from you. I hope this finds you both well. Hello Doug. Thanks very much. It was a very interesting story. I remember some of the locales mentioned in the story and every now and then, I visit my old neighborhood on the NE side. I grew up on 30th and Prescott and Alameda Drive from 1950-1964. My mother Marian Carl Eaton was a sorority sister and best friend to Maryon Kinsey. The Kinseys and my parents shared many good times together. I remember the annual Christmas cookie bakes that went all night and the many summers together at Cannon Beach. I recently visited Maryon and Lloyd and stopped by my old houses. The one on 30th looks the same. Alas, the English cottage home on Alameda Drive was recently altered and lost its integrity. Still, I smiled to the many good memories growing up on that street. Doug, my name is AL. My girlfriend and I live near 27th and Skidmore and we came across a drawer full of old photographs and items that belong to Lloyd and Maryon Kinsey from 2122 NE Alameda. Is there any way to you can get ahold of some of the Kinseys so that we can return it? Mr. Kinsey passed away this past summer. Maryon Kinsey has also passed in the last several weeks (January 2014). They will both be missed. I grew up across the street from them, and have many great memories of them. Wishing their family well. I’ve added a note about the Kinseys’ passing and have decided to keep the story there in honor of them. Thanks for letting me know. My name is Joyce Ward and I am the Kinsey’s daughter. I just read all of these kind words for the first time. My parents loved their home and neighborhood. I am glad they did not witness the demise of their beloved home. That would have been too much to bear. Thank you for all of your kind words.